Today's watch is more than a timepiece. It can be a fashion statement, a status symbol or a practical tool. Not only do watches come in all shapes, sizes and styles, but they often have additional functionality. From calendars to global positioning systems, modern watches sport a variety of technological innovations and come in a variety of price ranges. Whether you're shopping for an inexpensive fashion watch or want to find out how to recognize high-end designer timepieces, LoveToKnow Jewelry is a go-to resource you can count on. There are many different types of watches available, from very inexpensive fashion styles through high-end designer pieces, with many choices in between the two extremes. Low-cost watches can be practical time keeping tools as well as affordable accessories to complete just about any outfit. Options in ladies fashion watches vary from colorful pieces embellished with floral patterns or beaded watch bands to gold-tone styles with metal or bracelet-style bands to digital watches perfect for outdoor activities. Top quality watches can be fashion statements, as well as excellent investments and collector's items. Rolex watches are often viewed as the ultimate status symbol, though there are other highly desirable upscale brands like Tag Heuer, Chopard, Vacheron Constantin and many others. While these watches come with impressively expensive price tags, they represent a classic, elegant style popular with discriminating consumers who are interested in both quality and status. Discover how to select watches for different occasions. 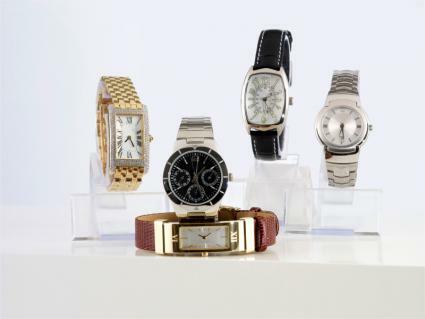 Visit the site any time you're looking to learn more about watches for men, women and children.